It was love at first sight for Lau Kok Gong when he met Tsui Chiu Ching, a widow who was 10 years his elder. To avoid the judgement and disapproval from their family and neighbors, they eloped and moved to a remote location in China. In fact, the location was so far removed that it was difficult for Tsui to get around. Lau decided to use his hands to carve a man-made staircase so it would be easier for his wife walk through the mountainous land. In took Lau 50 years to complete the staircase which stretched 6,000 steps. Their story was picked up by the media in 2002, and Lau passed away in 2007. The story of Lau Kok Gong and his wife, Tsui Chiu Ching, was so moving and touching that it inspired the hit song Staircase by pop group, C AllStar, as well as TVB to create a series based loosely on their story. The Last Steep Ascent <天梯> stars Moses Chan (陳豪), Maggie Cheung (張可頤), Aimee Chan (陳茵媺) and Kenny Wong (黃德斌) and will premiere on September 17. 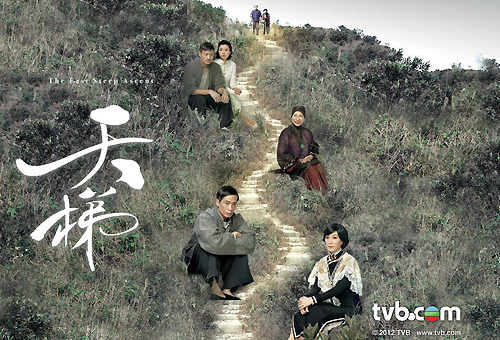 Like all TVB series, the producers included a dramatic storyline in order to hook the audience. Moses Chan plays the part of Miu Teen who first gets a glimpse of Koo Sun Yuet (Maggie Cheung) on her wedding day and falls in love. Sun Yuet marries Ho Sei Cheng (Cheung Kwok Keung 張國強), the rich owner of an herbal shop. It was not before long that Sun Yuet discovers that Sei Cheng was having an affair with his helper, Oi Tai (Aimee Chan). Sei Cheng passes away shortly after and Sun Yuet takes in Oi Tai when she finds out that Oi Tai is pregnant with her husband’s child. During this time, Miu Teen is working in the herbal shop and secretly pining for Sun Yuet. The drama takes a sharp turn when Sei Cheng’s family battles with Sun Yuet on the rights to the herbal shop. This is when Miu Teen steps in to confess his love for Sun Yuet and convinces her to move away with him to start a new life together. Miu then uses the next 50 years to handcarve a staircase for his beloved wife so she could get down the mountain more easily. Since Maggie is no longer contracted with TVB, she will not be participating in any promotional activities, which is a disappointment for her fans because her character is portrayed positively in this series. The roles also proved challenging for Moses and Maggie because they have to portray an aging couple throughout the series. In real life, 43-year old Maggie is only 2 years older than Moses. However in the series, her character is 10 years older than him! On the other hand, Aimee has a chance to shine in The Last Steep Ascent because she plays the role of a third-party who will get raped. Aimee has many crying scenes which will be a test of her acting capability. The highly-anticipated series, The Last Steep Ascent will broadcast in Hong Kong on Monday, September 17. She has just shot TVBuddy – mascot of Txb. And she still wonders why Txb dun contact with her to promote for this LSA. I wonder, is she that naive? Actually,way before this CTI event Maggie had already told Tim Gor at the time when they were still shooting the series that she would participate in the series promotional events if invited as she considered that to be part of her responsibility as the female lead in the series. Where does it say she’s wondering why TVB hasn’t contacted her? I thought she said that if TVB contacts her, she will attend. This is produced by Lee Tim Shing right? BAd poster! No dimensions whatsoever, no perspective adjustment, I have seen fan posters doing much better. I will not be watching this. Saw the trailer, wasn’t attracted to it. But like Maggie. Though I wonder why Moses? I mean no actual younger man? Because Maggie doesn’t look much older than Moses. Maybe the point is because she takes good care of herself so she looks good? So based loosely… maybe tv version is more dramatic but less romantic? I could not stop crying after reading the real life synopsis – I posted below. Wish TVB went the route of La Femme Desperado and casted Raymond Lam with Melissa Ng. Also don’t know why they used Moses Chan. Raymond Lam would have been an excellent choice, or even Kenneth Ma. I’m also not very looking forward to watching Aimee Chan. But I like Maggie and Edwin Siu, so I will be watching this. I’m also a fan of LTS’s works. Casting Raymond Lam or Bosco Wong will make the characters’ age gap more convincing. Why Moses? It’s not like Moses is that brilliant of an actor and irreplaceable? Bosco and Raymond has extremely full schedule for last year and this year. They only make 1 TVB series on average for these two years and they both never filmed for LTS although they are the better candidates and capable to pull of the young man-older woman romance. Why didn’t LTS consider Raymond Wong? He worked with LTS a few times before and looks younger than Moses. LTS has also casted Raymond Wong before in his series Bottled Passion. So I also ask the same question which others ask, why Moses Chan, LTS? Tim sir did want to cast LF for his product (Bottle Passion was originally given to LF by Tim sir), but they have never had time for each other. This time I guess it’s similar. LF had HAL to fulfill his task for the year. But Maggie and Moses as young bro – old sis is kinda 😛 to Tim sir. They dun have that much age gap, especially on look. 4. Raymond W – available! finally! Then later LTS complain to press that it’s so hard to get a TVB male lead LOL. If Raymond W also busy at that time, who will LTS find next? LOL. Maybe KM or KC? Yeah this is produced by Lee Tim Sing. I think they’re just pushing this series out just to get it over with because the main lead, Maggie, is already with CTI and while they can’t have her promote, they’ll have to utilize on Moses and Aimee. Good luck! It seems the poster was thrown together at the last minute. Hopefully the storyline will save it all. Beautiful story and he died before her. Is the lady still alive?! And I see the pictures from the montage, the way he looks at her…. very very beautiful love story. Life is hard but why run off to an even harder place? The world is so big, surely there must be a place they can start all over without hiding themselves away? What about children? So what happened to her child? I could not find better English summaries (can’t read Chinese) but from the bits and pieces I could gather. He fell in love with her at first sight when Liu was 6 and Xu was 16 (first married). He begged to take care of her when her husband passed (him 19 her 29) but was ridiculed by society. So they took (her 4 kids too) and ran away to the mountains. In all they had 7 kids total. Any follow up on the children? I place the time period of when they ran away to (Liu died in 2007 at ~72 – which places their elopement between end of WWI to CCP takeover of China). So there must have been political turmoil. Wow, what a great love story. He loves her for 50 years and the love is unwavering. This story reminds me of another story where a man plants a huge heart-shape tribute to his late wife using 6000 oak trees. No can’t find any focus stories on the 7 children except they are all grown adults now. The oldest son brought his father’s homemade kerosene lamp (made from a bottle) when he accepted award (on behalf of parents) for Top 10 Love Stories in China. Thanks for the link. What a love story that even fiction can’t write any better. Poor woman. Wonder how she is now. The real life story is beautiful. What a touching love story. Why do I have this feeling this will only happen in the last 2 episodes or so? This is exactly why I most likely won’t be watching this series. It’s a cheap gimmick to say it’s based on the real-life love story. They’re not gonna focus much on it. The best part of the love story is the touching LOVE behind it, not family drama and whatnot. You can’t really tell that there’s an age difference between Maggie and Moses. Maggie has not aged well, and they should have cast a guy with more of a baby face so the age difference is more obvious. Moses and Maggie look same age. Why not casting a younger actor or older actress? Exactly! Edwin Siu makes a better comparison if according to the drama script. Just what i was wondering too! Moses looks older than Maggie (she’s blessed with babyface and good skin! ), it just seems like a regular couple where the man is slightly older. The problem is probably because there aren’t any 1st line lead actresses who look mature enough to take the female lead. I think maybe Sheren Tang or So Yuk Wah could have been good replacements. I don’t think i’ve seen a collaboration between Ah Mo with Ah So before, so that could’ve been interesting to see their chemistry together. TVB we’d like to see new pairings please!! Anyone notice that the cast in this series consist of regular cast of Chik Kei Yi? Lacks Ada Choi/Maggie Siu or it’ll make a perfect Chik. Maggie Cheung is a good actress. She acted well in her characters. Probably that was the reason why “she usually became popular with audience”. I wonder how much this series will focus on the love story. With the big family setup, looks like the series will focus more on family members fighting/scheming for inheritance. For LTS series I’m sure there will be much of the family fighting – just hoping there will not be any clapping. How come he always gets the Mid-autumn fest slots? My fear again is the whole running away to the mountain and carving the steps will be like an epilogue. Or it may start as a prologue. This story in its original form would have made a good 2 and a half hours movie. Even setting aside the age issue, Moses seems so worldly and jaded, I can’t imagine him as young and naive 19 yr who throws away everything for puppy love. He can totally tackle the years later building the staircase guy. No even in that I can imagine a super stubborn Joe Ma (from Maiden’s Vow). WAIT!! Kenny Wong with Moses again! THIS is the real love pair! WAIT!! In the poster, did they use the real couple’s image at the top?! If yes, TVB, did you pay???!?! That’s Moses and Maggie… it shows that in one of the trailers. What are you getting so excited about, Funn? I can’t make out who those doll-like figures at the top of the poster are. Perhaps my eyesight is poor but I just had it fixed. Anyway, I just love romantic stories like that and hope it turns out good although Moses is certainly not my hero! Because it looks sorta like the couple in the montage in one of the links. I’m actually on the lookout for the TVB tradition of making Kenny Wong to have some kind of physical or social defect. I think Moses is top tier when it comes to current crop of actors for complex, ruthless, and angry characters or the opposite spectrum for physical comedy. Puppy love that started at age 6, I have a hard time. Given time slotting issues, I can even see Oscar Leung or Vincent Wong. The real life story is set at 19 and 29 – there are plenty of actresses whose real life age is over 29 – I guess there is no male lead who is close to 19. TVB doesn’t like the perfection of Kenny Wong, so they always make something wrong with him. Lee Tim Sing should have cast Raymond Wong in place of Moses Chan. Wong looks legitimately younger than Maggie and he is 10000000x better than Moses in the blue collar romance department. Maybe an older woman will do? Elena Kong? Too old? Elena Kong is 40, a year younger than Moses, and she does not look a lot older than Moses. Moses just can not pull off looking younger because of his strong facial features. I agree. I don’t see Moses pulling off the love story very well, but Raymond could have exceeded in it. I don’t think Elena Kong can pull off as a main lead. She’s a good actress. Just doesn’t quite have the “je ne sais quoi” of a leading actress. Aimee looks good in a cheong sam in one of the photos. Why didn’t they pair off moses and her? It would indeed be a ‘true’ love story then. Did anyone watched the 1st episode? How was it? I watch episode 1 yesterday. I was not touched by Moses and Maggie’s story in the first 10 minutes. But, I was very touched by the love of Moses’ elderly parents. Such great love.